80% of our customers have the requirement of bringing HR module to the Frontend. And to fulfill their necessity, we have already released the HR Frontend extension. If you are an existing user of HR Frontend, you surely know the way it works and how it could benefit your company. However, we want to provide you the best possible solution so that you can streamline your business. And also get benefits that you really deserve. Keeping that in mind, our product and development team planned thoroughly on making the frontend better for everyone. Why is Frontend Dashboard for WordPress HR Complicated? 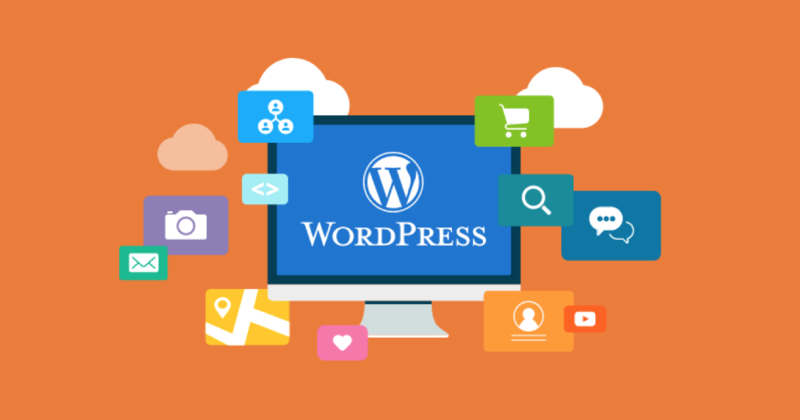 While using WordPress, we often use different types of plugins as well as themes to solve many problems. This often creates problems with the natural process of how things work inside the ecosystem. In simple words, conflicts occur inside the site and this is certainly a big issue for everyone. That is why our aim was to make provide you with the best frontend solution for our WordPress ERP. Here are the things that we considered. The first and foremost thing that we decided to look after is the design of the HR frontend that we are trying to build. As we said earlier, different themes and plugins create various types of conflicts and it's our duty to make sure all our products are free of them. However, it's not fully possible to make a WordPress plugin conflict-free. Besides that, performance is an important factor to consider when trying to make a plugin work properly. Due to lack of scope in case of using recent technologies like Vue.js and REST API, it is difficult for a developer to bring out the best solution they are intending to provide. We are no different from this scenario. This clearly creates problems in smooth performance without conflicting with other available plugins on the WordPress site. WordPress backend is a bit slower than the frontend. This has been a serious issue for a long time. 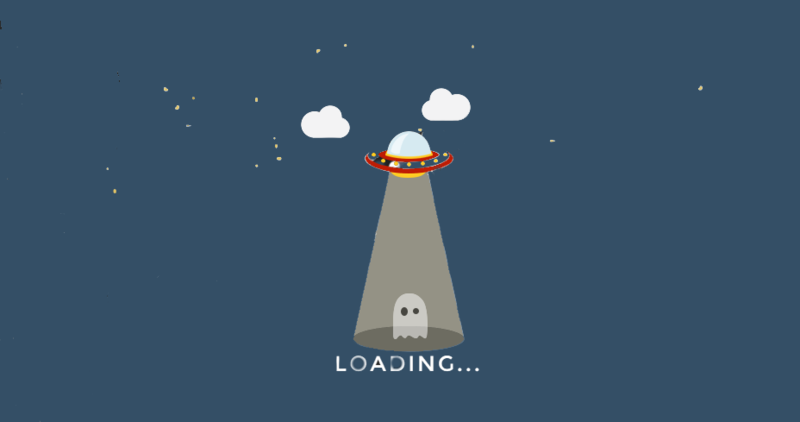 That is why optimizing the page loading time is considered as a best practice for WordPress. Recently, one-page apps or plugins have been emerging to provide fast experience. 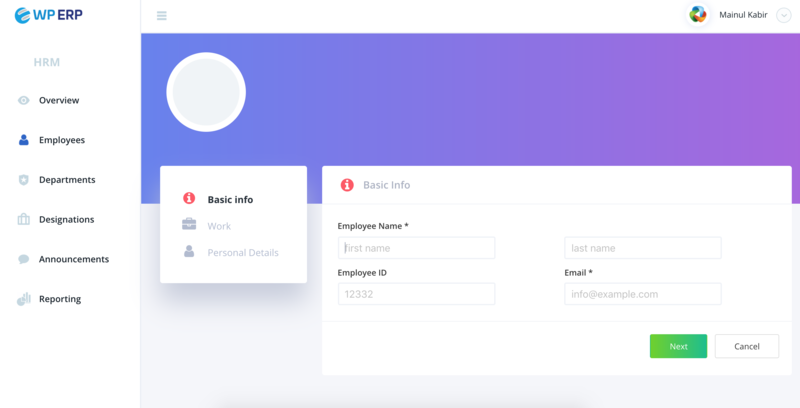 weForms, a contact form plugin is a good example of it. This fastest contact form plugin for WordPress creates amazing forms without loading pages. WP ERP already has a frontend solution for the HR module. It creates three (3) HR pages in the frontend so that you can get a dashboard where all your HR data is shown. 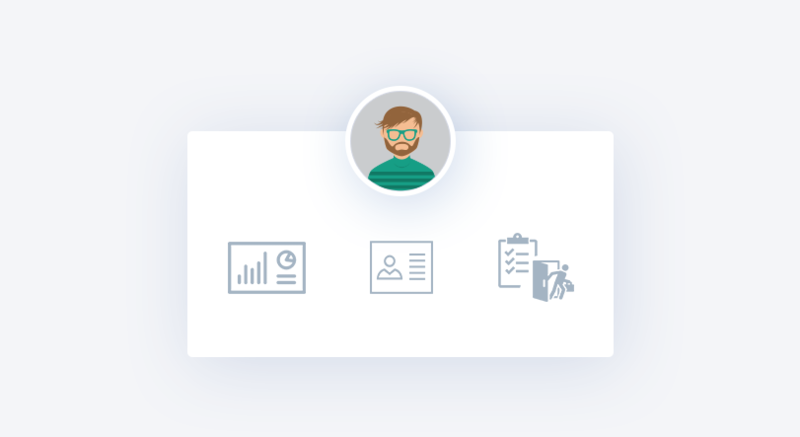 Your employees or team members also get their own profiles right on the frontend. This effectively increased the security, privacy, and performance of the solution. But, we want to give you more opportunity – a smooth experience so that you can use our solution with ease. To minimize all the problems we have stated above along with providing a modern smart solution that can solve HR related problems without creating conflicts on your website – we present a new era in WordPress with our WP ERP Dashboard with HR Frontend module. Custom Permalink is one of the most significant features of WordPress. If you don't know what a permalink is – you can read this article. Our development team came up with an idea to utilize the powerful custom permalink feature. Thus, they have opened a new area with it. With they latest approach, they made sure the new Frontend Dashboard solution loads only the HR frontend assets for the URL. And guess what, this potentially prevents conflicting issues of your site. And the output of our hard work is the latest version of HR Frontend Dashboard. We have completely revamped the solution just for you. Now, we call it the WP ERP Frontend. And the previous HR Frontend Plugin will be a part of it. Our plan is to bring all the modules of WP ERP to the frontend. Currently, we have started with the HR module, the most demanding module of WordPress ERP. You can go through the following video to get a quick overview of the solution. As you can see, this a completely new experience for a WordPress user. You are getting an advanced dashboard where all your data will be displayed in an organized manner. Besides that, you can manage almost everything the WP ERP HR module has to offer. As the new HR Frontend is a one-page application created with Vue.js and REST API, it loads fast without lagging. 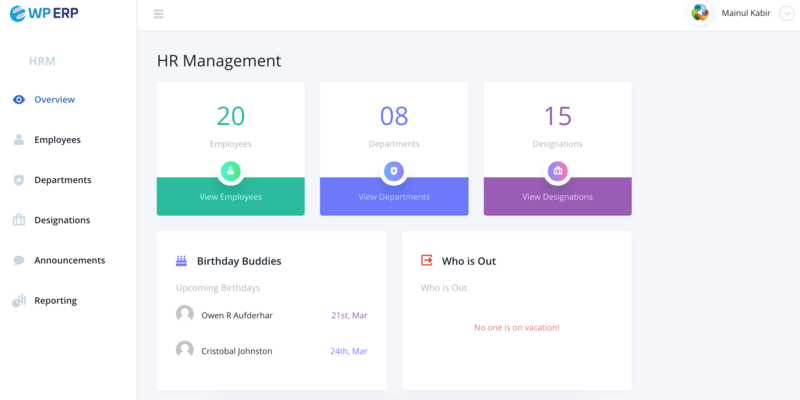 Both you and your employees will be able to use this super fast dashboard. And this will effectively increase your productivity. As we have already stated the problems and what we did to minimize them, the solution works properly without creating conflicts with any other themes and plugins. It's completely standalone and does not load any other assets while working. This makes sure the dashboard is suitable for any WordPress site running on any theme and it doesn't matter which plugins you are using. WP ERP HR module has everything you need to manage your company human resources. However, it was only available in the backend of your WordPress site. With the previous HR Frontend, you could get certain pages using shortcodes. With the latest release, you don't have to use shortcodes. All you have to do is install and activate the ERP Frontend plugin. Then, reset the permalink from your WordPress Settings page and you are ready to experience the HR Frontend in Action. Most importantly, you will get all the features that are in the backend of your WP ERP HR module directly to the frontend in a better, organized and meaningful way. Read our detailed documentation for more information. 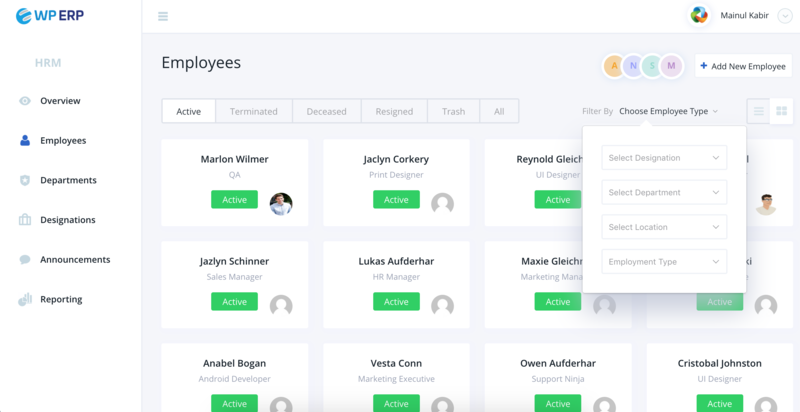 The latest HR Frontend Dashboard allows you to create new employees and manage the existing ones. You can get a great overview of the entire human resource of your company. And all of these right from the frontend of your company website. You can even filter your employees depending on different criteria and conditions. The same goes for all the departments and designations. You can also change the view of your employee and department listing. Previously, you had to navigate to the backend for publishing companywide announcements for your Human Resource. 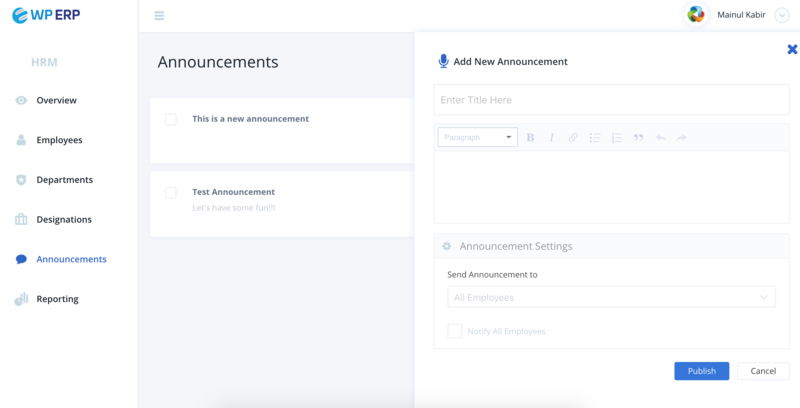 Now, this latest release gives you the opportunity to publish the announcements from the frontend and your employees will view them from their dashboards. 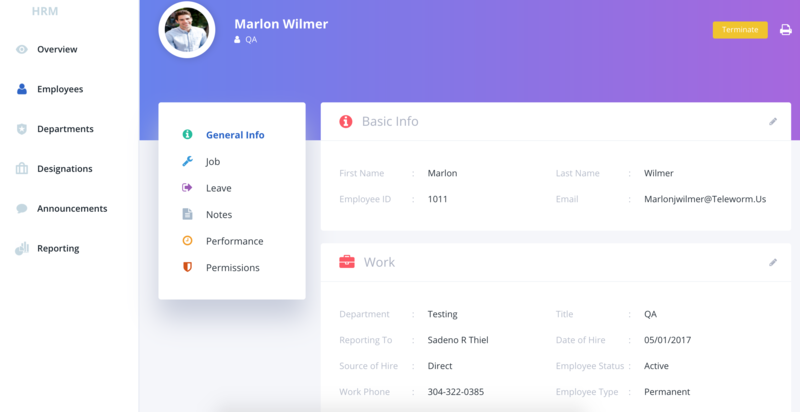 All of your employees will get their own profiles right on the frontend. 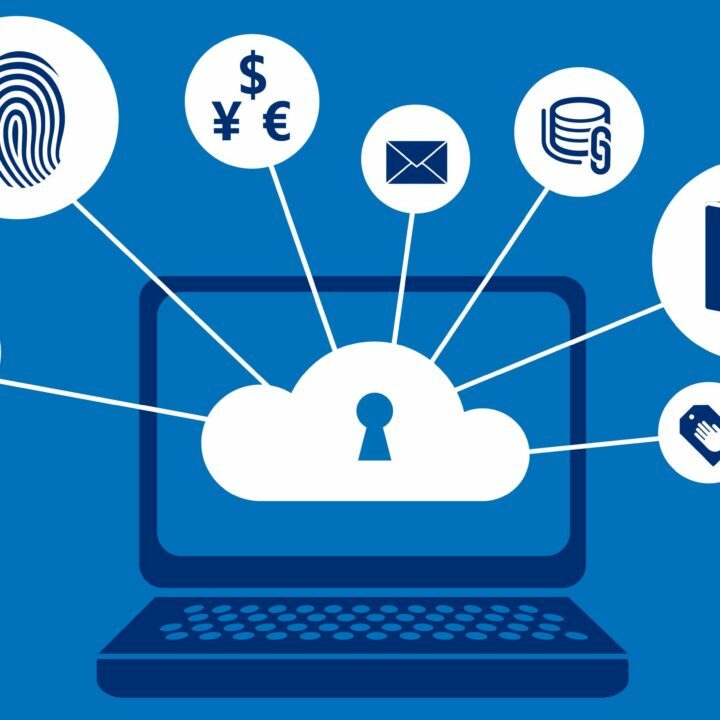 This effectively increases the security and privacy of your website. You don't have to let your employees log in to the backend of your site. 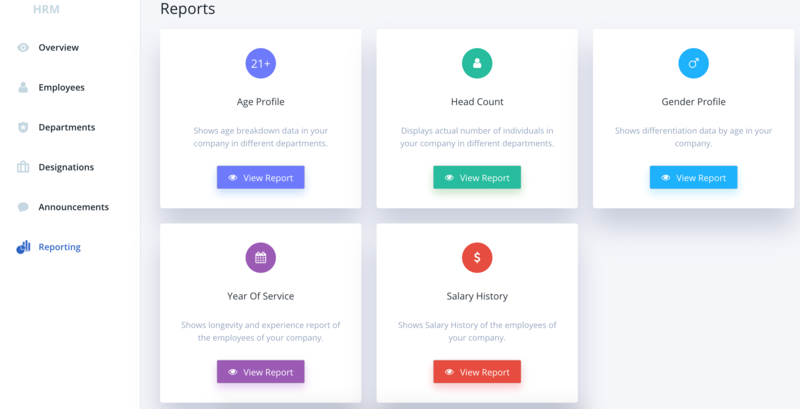 You can generate useful reports of your Human Resource directly on the frontend. Your HR Manager can use those data for future decision making. The new HR Frontend Dashboard makes everything easier. You can change the slug (permalink) of the dashboard the way you like. Currently, HR Frontend supports Attendance extension and allows your employees to check-in, check-out and view their Attendance report from the frontend. We will integrate other extensions in the future. The revamped version of WP ERP HR Frontend has many things to offer and it is extremely better than the previous one. 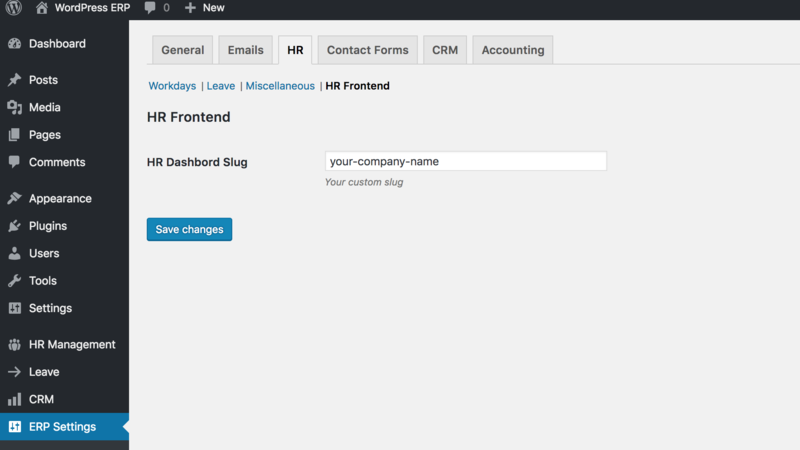 However, we are giving away this new frontend solution for FREE to the users who are already using HR frontend plugin. But the thing is we will be changing the current pricing plan and decided the price be $79 for 1 site. This is an exclusive solution and it deserves to be available for all users. And get an instant discount while checking out. We believe this new solution will provide you the best HR Management experience possible inside WordPress. Also, don't hesitate to share your opinion on our latest release in the comments.